Denim Premiere Vision is ready for its upcoming edition taking place at Paris Event Center, La Villette, on 26-27 April 2017. The show is hitting its 10th anniversary while preparing itself to celebrate its 20th edition in November 2017. The show will disclose a series of new catchy projects and ideas. Among them, there is the first “Denim Premiere Vision Hackathon”, whose name is inspired by reality shows’ marathons, digital interactivity and, of course, innovation and creativity. The project wants to involve five teams, each one made up of five members. Every single team will have to work on a specific theme and create an innovative project, either a brand concept or a marketing initiative while spending 48 hours (duration of the show) inside transparent cubes – the “Hackathon rooms” – sharing ideas and building up their project. Three mentors from fashion, technology and marketing will guide the teams. Each team will have different international fashion and technology students. Mentors will be Stefano Aldighieri (Arvind Ltd), Romain Spinali (Spinali Design) and Ariane Bigot (Premiere Vision). The projects will be presented to a jury that –on 27 April at the end of the two-day show- will select and prize the best one at 4 pm. The winning team will win €5,000 and six months of professional coaching at Denim PV. The jury will be made up of Catharine Anderson Jone (Cordura), Alex Brownless (Arts Thread), Alberto De Conti (Garmon) and Alain Melloul (M.I.C.). At the very entrance of the show a new interactive, immersive and inspiring experience space will welcome visitors. It will present f/w 2018/2019 trends offering insiders a mix of physical and digital experiences. 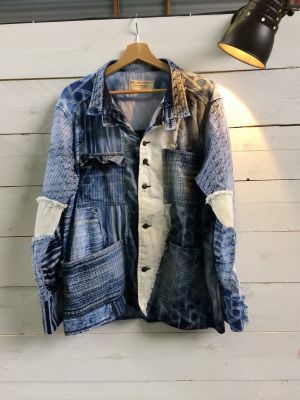 Climatic performance and thermal activation, luminosity, augmented reality, robotics and connected technologies are all directions well worth exploring to dream up the denim of tomorrow. The area will present most creative products from the show’s exhibitors (weavers, laundries, manufacturers and accessory makers) in a highly involving environment. Also part of this area will be a series of special projects presented within this space. There will be innovative products embedding new technology like a jacket providing the sensation of caress (Issho) on the wearer’s shoulders, a windbreaker equipped with portable solar panels (Solaar Windbraker) but also garments integrated sensors that can help creating a personalized itinerary (Rochambeau Bright Bmbr) or jeans that can guide the wearer with special vibrations (Spinali Design . My Rags’ technology is a new 3-D software through which jeans can be designed and linked with productive platforms directly. Denim PV will maintain stable exhibitors - 84 companies. Among them, some will be part of a specific innovation path. Garment manufacturer M&J Group, for instance, will disclose a special software through which one can measure and exactly certify how much water is employed when treating and finishing a pair of jeans. Advance Denim will launch a new thermo-regulating and breathable fabric that can be 100% recycled. Artistic Milliners, while exploring new opportunities for denim, will launch an indestructable denim. Artistic Fabric Mills is presenting an app that can provide complete transparency and traceability on how their fabrics are produced - from cotton to the final fabric – up to the finished garment. Also new are Cone Denim’s new White Oak’s Selvedge bi-stretch denim made with highly resistant fibers. Vicunha will launch different fabrics with distinct heat thermo-regulating properties and climatic performances. Jeanologia will launch its new Quantum technology, a new digital simulator through which they can create the final result of treatments while saving resources, energy and costs, and reducing the impact on nature. The Government of Morocco, committed to support and promote its denim industry, and the AMDI (Moroccan Agency for the Development of Investments) involved visionary François Girbaud in designing the special jeans collection “Made in Morocco”, entirely manufactured locally, around the “Cleaning the Planet” theme. Aim of the initiative is also to disclose how the Moroccan denim industry can offer creative solutions, cutting-edge technical innovations, and an increased commitment to responsible production. On Wednesday 26 April at 12 pm, a conference will disclose all the advantages of producing in Morocco, and, on the same day, at 6 pm a denim happy hour will celebrate Moroccan innovation. Denim PV, together with SPORTSWEAR INTERNATIONAL, will be hosting two 30-minute masterclasses per day to explore the industry’s latest innovations and upcoming developments. Both on April 26 (2 pm / 4 pm) and 27 (11.30 am / 2 pm), industry insiders will talk about smart creation, innovation, and new trends for the denim market. Innovation, fresh opinions and fast-forward thinking information will circulate at the upcoming edition of Denim PV, an appointment not to be missed. For more information on trade shows check out DFV Group’s expocheck.com.